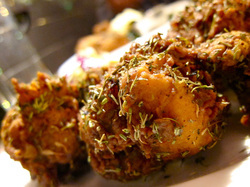 Spicy Fried Chicken The Desi Way. Long before the mainstream fastfood chains caught on Desi's throughout the world have been preparing this mouth watering dish from the comfort of their own kitchens. Check out the recipes below and maybe you can make your own spicy fried chicken soon we have three awesome videos for you so you have no excuse to fry up some chicken The Desi Way.